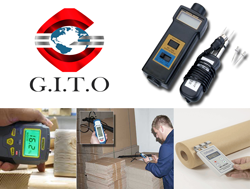 In G.I.T.O’s inspection procedures MC-7806 IS used for the highest level of accuracy with fast measuring & response time. MC-7806 Moisture meter incorporates a range of design refinements and advanced features to bring a TOP QUALITY 2-in-1 METER that detect moisture & temperature. It has Microcomputer LSI circuit advanced microprocessor technology and crystal time base that guarantees measurements.